This is the weekly Frugal Tuesday Tip, a linky blog hop, dedicated to encouraging the frugal lifestyle. I’m at college orientation with my oldest child right now. My frugal tip is to attend in-state, public institutions for higher education. They are a great value. And dig this: the families we’ve met from other states are saying that Iowa’s out-of-state tuition is close to their in-state tuition back home. You can read my entire tip at this link here. New to the Frugal Tuesday Tip? Please use your permalink, which is the URL to your post not your home page. If you don’t know what a permalink is you’ll find instructions here. Please keep your post on topic. Please link to a post you have written in the past 7 days. Please DO NOT link to a giveaway. Please link back to one of your hostesses or add the button below to your post. 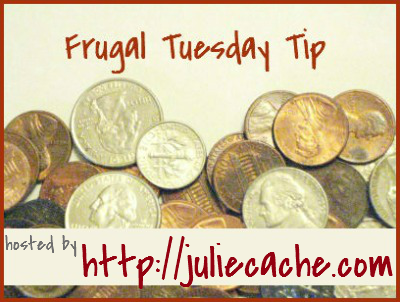 Frugal Tuesday Tip and a Winner! My oldest just graduated from college debt-free, so we know it is possible. I am glad you are sharing tips from your experience so people know there is an alternative to racking up college loans. Iowa does have really low college tuition rates! Unfortunately, PA does not…. Thanks for hosting, yet again! Love this link up!